I don't want to date myself, but I've been nerding out on beer in Salt Lake City for a long damned time. Some of my earliest craft-beer memories involve getting growlers at Uinta's original 1700 South brewery, and experimenting with some Beehive Lager at Squatters. Those flavors are still fresh in my mind all these years later because of the impact they had on my newly emerging quest for taste on top of buzz. A few of those classic palate-shaping beers are still around, and their popularity and influence is as strong as ever. Here are two beers that have stood the test of time. 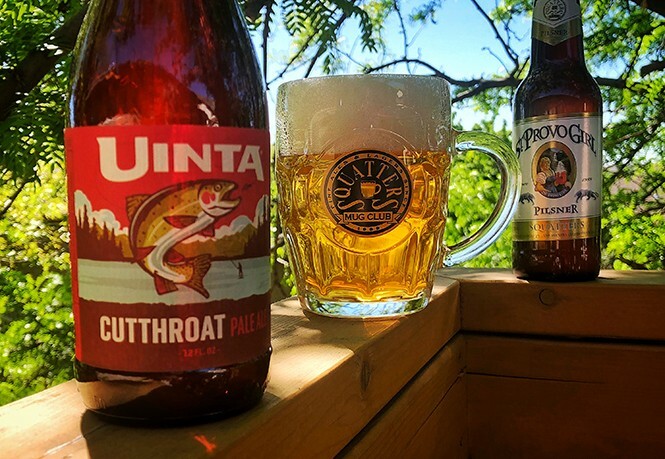 Uinta Cutthroat: This is probably one of the more influential beers to ever enter my life; it was pretty much a staple for me during the 1990s and early 2000s. I don't get back to it very often, but when I do, it's like a time machine on every first sip. The clear, ruby-amber color is enough to get my salivary glands firing, along with its pillowy cap of foam that rarely fades away. The aroma is somewhat earthy and malty, but does have an unmistakable piney/spicy bite from the cascade hops. It has pretty close to an equal balance of caramelized grains, roasted malts, citrus and spicy hops, yeast bread and fruit esters. The transition from nose to tongue is fairly seamless, starting with a moderate dose of hop with plenty of balancing grains. Cutthroat's more prominent notes include floral/citrus hops, pine, medium crystal malt, toasted cereal grain, yeast and some pear. Overall: There's something wonderfully natural about this beer. If you're familiar with this ale in its purest form, it'll transport you back to the time you first tried it. It's a classic example of harmony and depth in a small 4 percent ABV package. This beer was groundbreaking 25 years ago, and it's still a solid option any time of the year. Squatters Provo Girl: When the world's spotlight shone upon Utah in months leading up to the 2002 Winter Olympics, we had a casualty in our corporate branding world when the makers of Germany's St. Pauli Girl didn't find the humor in Squatters' play on the name of their St. Provo Girl Pilsner. Through all of the rebrandings and attempts to mothball this beer, Provo Girl has managed to weather it all, and continues to be the Little Beer That Could. It pours a clear, golden straw color that is light on carbonation and features a thin, white, frothy head. The aroma is typical of the style, with grassy hops and a grainy malt coming through right away, while being backed up by a light and sweet caramel note that balances out the hops. The flavor starts with a good dose of caramel and cracker, with a nice punch of bread dough backing it up. The maltiness transitions into the bitter realm with grassy hops. As this 4 percent lager sits on the tongue, the bitterness slowly intensifies, creating a dry lingering feel that drives up its drinkability. Overall: This beer has always had a great presence on the palate. Its snappy, crisp and refreshing flavor combo is simple and familiar in a landscape dominated by identical macro lagers. I'll go out of my way to say that Provo Girl's finish is without a doubt the best part of the beer. There are reasons that these beers are still here after all these years. They appeal to the old-school palates and manage to draw in new converts based solely on drinkability and great Utah craftsmanship. As always, cheers!